Introduces children to proper manners with this child’s coat rack that teaches them to hang up their clothes! Each rack is made in the USA and constructed from solid wood.It makes the perfect gift for a baby or as a first birthday gift. 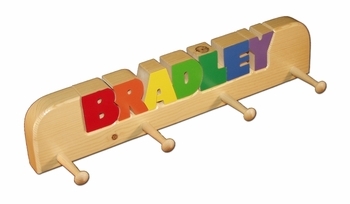 Letter colors are available in primary colors as shown or you can also have it painted in pastel colors. See More Images above to see the coat rack in Pastel Colors. 11 letters maximum. Size: 4 1/2" x 21" x 1 1/2" and comes with everything necessary to hang on the wall. See More Images above for more pictures of this product. NOTE: The "No Knots Option" allows you to limit any knots in the wood to the sides of rack only - an additional $15.00. Processing Time 2-3 weeks. Does not include shipping time. Personalization process on this product requires longer period of time and totally worth the wait.